Oral-B really outdid themselves with the packaging for the toothbrushes. The overall aesthetic of the boxes is really top notch and harkens back to the fantastic art used throughout the vintage Star Wars toy line. The toothbrushes are packaged in a window type box, with cutouts that allow you to view the toothbrush head and the artwork printed on the brush handle. The boxes are wrapped in cellophane to help protect them from the dreaded Tooth Demons. All six boxes can be found both with and without the word “NEW!” printed on the front. And in classic vintage fashion, the back of the boxes shows the brush handle artwork found on the other toothbrushes available in the line, encouraging you to collect them all.The artwork on the boxes more or less matches the artwork that is printed on the brush handle. 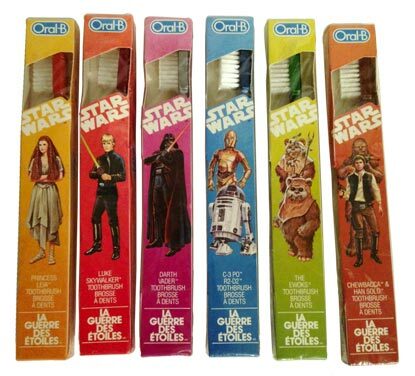 The one curious exception is Princess Liea who is shown wearing her Endor Celebration outfit on the box, but is wearing her Endor Battle Poncho on the toothbrush artwork. I would be remiss without a special mention of the fantastic Jedi Masters packaging. This exclusive toothbrush goes the extra mile with its packaging which features unique airbrushed art of the three Jedi Spirits. Later in the line, Oral-B started packaging the boxed toothbrushes on a blister card. The artwork on the cardback is very generic which shows the scene of Luke leaving Dagobah in his X-Wing from Empire Strikes Back. The back of the card has some illustrations that help teach you the correct way to brush and floss your teeth, which is quite helpful on a toothbrush package. 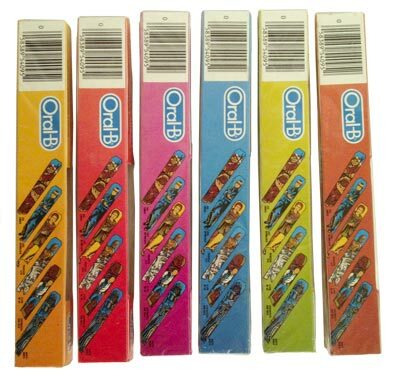 The carded versions of the toothbrushes are a little tougher to track down than their boxed counterparts. You can also find both variations of the toothbrush box on the blister packaging (with the “NEW!” text and without). Most of the blister packs that are found today have a bright orange Toys ‘R Us price sticker on them. This most likely points to the blister packaging of the toothbrushes being a Toys ‘R Us exclusive, however, that is unconfirmed at this point. This exclusive packaging is a cellophane sleeve that wraps around a 3-pack of toothbrushes that includes the exclusive Jedi Masters toothbrush. The 3-pack can be found in multiple combinations with the other six toothbrushes. 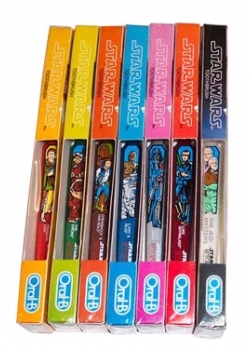 The cellophane sleeve features the “Buy 2 Get a Jedi Masters Toothbrush Free” offer text in bright blue. 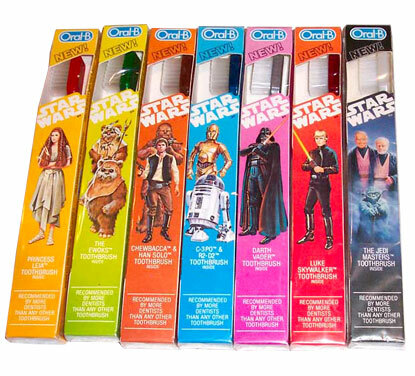 The three pack was the only way to get the Jedi Masters toothbrush. Not only is the Jedi Masters toothbrush tough to track down, but this 3-pack packaging is exceedingly rare and very fragile. One of the tougher portions of this line to track down is the foreign toothbrushes. 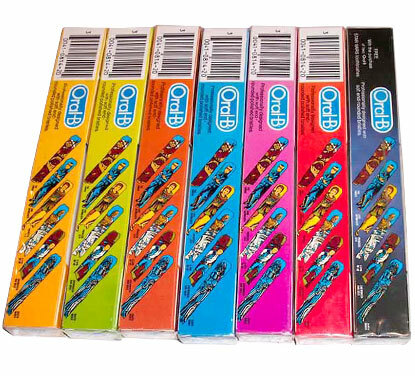 The Oral-B line of toothbrushes were released in 5 different countries around the world – United Kingdom, Australia, Canada, Spain and Germany with the latter 3 having exclusive packaging. All foreign release toothbrush packaging features the same window box design of their US counterparts with the same character artwork. These foreign packages are very rare, with the German and Spanish versions being the most difficult to track down. These foreign toothbrushes can also be found in cases of 12 brushes. Given the rarity of the foreign brushes on their own, finding an unused case of 12 of them is no easy task. Canada – While the Canadian packaging may be the least difficult to track down, it is still no easy task. Where it differs from the US packaging is the inclusion of both English and French translations for the words “toothbrush” and “Star Wars”. Collectors of the Star Wars toy line will instantly recognize the “La Guerre Des Etoiles” text that is associated with most Star Wars products released in Canada. Spain – Perhaps the coolest part of the Spanish toothbrush packaging is the “La Guerra De Las Galaxias” version of the Star Wars logo. It’s a great reminder of the freedom that other countries distributors had with the Star Wars license, that you just don’t see in this day and age. Other differences to the US packaging are the Spanish translations for “NEW!” and “Recommended by more dentists than any other toothbrush” text. Germany – Nearly identical to their US counterparts, the German packaging is almost unnoticeable. In fact the only differences are the German translation for toothbrush (Zahnbürste). The “Recommended by more dentists than any other toothbrush” text however isn’t present on the German packaging. Instead it says “Gründliche reinigung und pflege für zähne und zahnfleisch”, which curiously translates to “Thorough cleaning and care for teeth and gums”.